Network Glia e.V. accepts no responsibility or liability whatsoever with regard to the material on this site. This material is not necessarily comprehensive, complete, accurate or up to date. Some webpages are linked to external sites over which the Federation of European Neurosciences has no control. Links have been proved during setup. 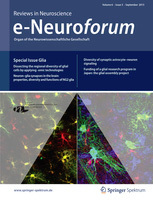 Since information on the WWW is subject of current change, the Network Glia e.V. accepts no responsibility with regard to such problems, or the consequences thereof, incurred as a result of using this site or any linked external sites. This disclaimer is not intended to contravene any requirements laid down in applicable national law nor to exclude liability for matters which may not be excluded under that law. Copyright Information included in the Website http://www.networkglia.eu graphics, fonts and files are subject to national copyright. Any multiplication without written permission of the Network Glia e.V. is forbidden. Copyright 2011 Network Glia e.V. All rights reserved.